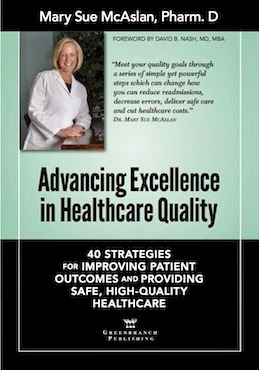 Greenbranch Publishing has just published a new book titled "Advancing Excellence in Healthcare Quality: 40 Strategies for Improving Patient Outcomes and Providing, Safe, High-Quality Healthcare" written by Dr. Mary Sue McAslan, Pharm.D. The book's intention is to "enhance quality, reduce readmissions, decrease errors, improve disease prevention, and cut healthcare costs" through providing 40 practical and easy-to-implement strategies. This is not your father’s textbook on quality and safety! Although several excellent textbooks on quality and safety are available, I wasn’t sure the marketplace was ready for Mary Sue McAslan - boy, was I wrong! McAslan, herself a pharmacist, has been toiling in the quality and safety field for three decades, largely unheralded, yet in her heartfelt style, she has delivered the goods. Her book is divided into four main areas of focus, including optimizing outcomes, reducing readmissions, minimizing medication errors, and promoting disease prevention. Each of the four areas, then, has 10 specific, practical solutions that can be implemented almost immediately. This is the core strength of McAslan’s work: a no-nonsense approach to a field that has more than its share of nonsense over the past 30 years. Any practitioner, including doctors, nurses, pharmacists, and physicians’ assistants, could take the information from this book and improve what they do the very next day. It is an easy read with almost a checklist quality to the recommendations. There is no barrier to entry in getting the work done because McAslan’s style is so easy to understand: no complex formulas, no impossible-to-read flow diagrams, no arcane Pareto analyses, just solid advice about what to do with our next patients so that their care is of a higher quality and certainly is less prone to error. Who should read this book? I believe McAslan has created just the right recipe that would appeal to the tastes of nearly everyone. That is, the book is appropriate for nurses, pharmacists, practice managers, hospital administrators, and physicians’ assistants. In fact, it would be the perfect introductory text for an interprofes- sional attack on these issues. Given the current emphasis on team training and interprofessional training, McAslan has written the right book at the right time. Finally, I was impressed with McAslan’s “can-do” attitude. There didn’t seem to be any problem too complex that could not be further elucidated into its compo- nent parts and therefore readily tackled tomorrow. She has an uncanny ability to simplify the work of many others who have gone before her in a way that is easy to digest. Kudos to McAslan. I hope that Advancing Excellence in Healthcare Quality gets the wide readership that it so richly deserves. I only wish her book had come around earlier so we could recommend it to every trainee! The book is available in print at Amazon.com or in print and eBook at the Greenbranch Publishing Online Store. To learn more, visit www.greenbranch.com/40Strategies.